After a little bit of a lull in the nail art department over the wintry period we've had of late, Spring finally has decided to unveil itself and therefore I've decided to get back into the world of nail artistry. You all know I'm a big fan of nail art, and I'm always looking for inspiration and new designs to try out. 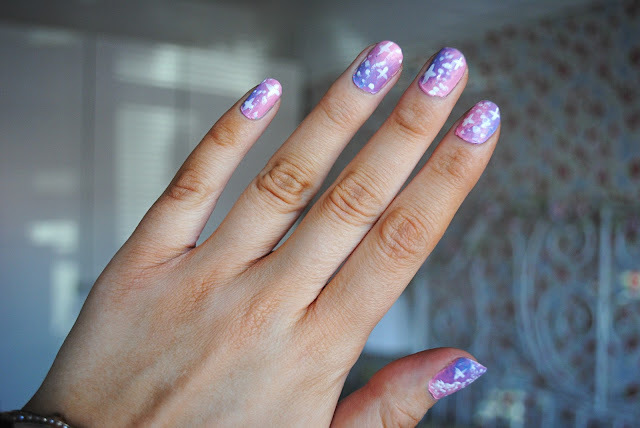 I'm really into lilacs, pastel pinks and baby blues at the minute (well let's face it, I always am), so when I spotted a twinkly star nail design on Tumblr I just couldn't resist giving it a go. 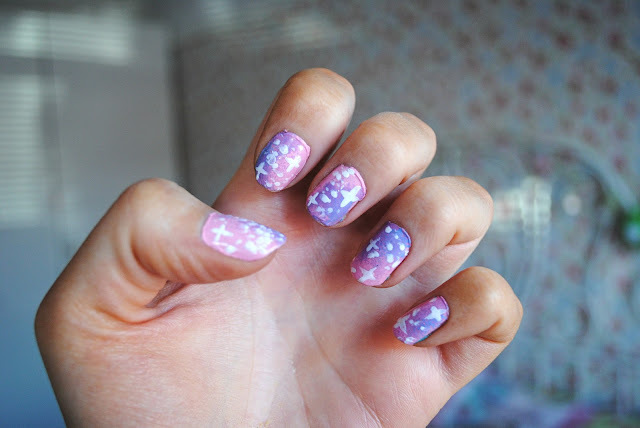 This design is seriously easy to do, and creates a gorgeous, ethereal and somewhat Disney-esque twinkly star theme. You can use whichever colours you like, but I opted for my favourite hues, in the forms of Estee Lauder's Narcissist, Barry M's Blueberry Icecream and, an oldie but a goodie; Eyeko Lilac Polish. To recreate this look, all you need to do is paint your nails in the lightest colour all over, which for me was obviously the pink. Let it dry, and then using a tiny sponge (I just trimmed a corner off a kitchen sponge) gently dab on the middle colour (in this case, the lilac) onto little sections of each nail sporadically. Leave this to dry, and then follow with the darkest colour (the blue), and literally use the tiniest bit just to give the nails a bit of depth and create an almost ombre-type affair. Don't worry if the colours don't look very well-blended, as once they have dried use the white nail art pen to gently dab tiny dots of varying shapes and sizes, along with little crosses, to create the illusion of twinkling stars. The white breaks up the background a bit and makes the colours blend more naturally. 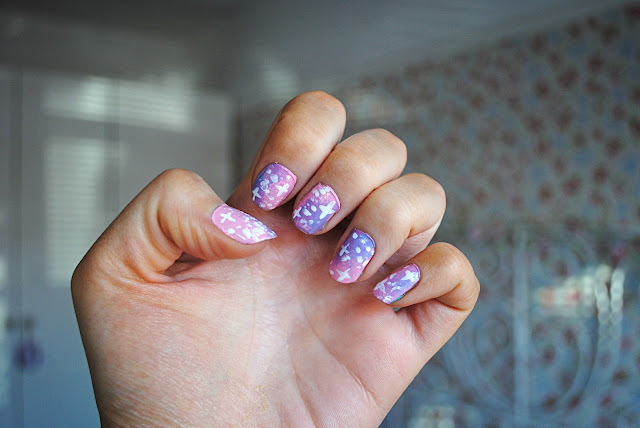 Finish with a topcoat if you like, and voila, you have beautiful starry nails! Are you getting into nail art now that Spring has arrived? Feel free to post links to your designs in the comments! 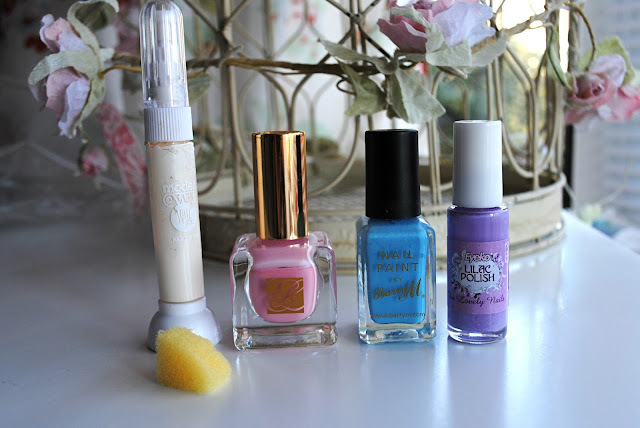 Also - I uploaded a March Favourites video yesterday, click here to check it out.